A schedule of our remaining seminars and Ecuador real estate tours for 2009 is below. There is also information about shopping in Salinas and a green investing idea. Please note that we have added a Southern Ecuador coastal real estate tour that will be conducted by Amy Pinoargote. Here is an interesting explanation that Amy sent about shopping on Ecuador’s southern coast. Salinas has several large, modern grocery stores, but the savvy shoppers don’t buy their produce there. 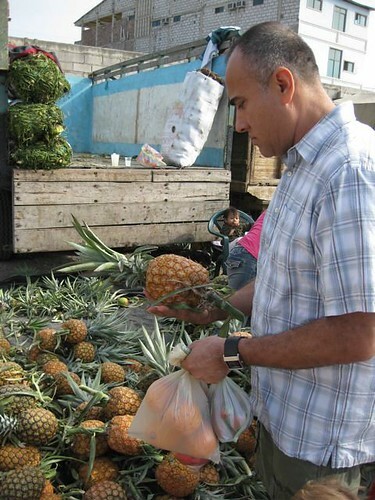 Instead they travel just a few miles to the “Plaza” or farmer’s market in nearby La Libertad. This huge market is open 7 days a week. Not only is the produce sold here even fresher than that sold in the supermarkets, it also costs less. Ecuador’s climate lends itself to year round cultivation of a variety of both familiar and exotic fruits and vegetables. 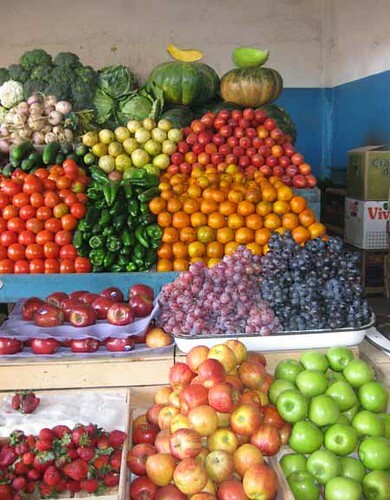 You can always find tomatoes, avocados, carrots, oranges, endless varieties of fresh beans and other staples. How much can you expect to pay? A couple of dollars will go a long way. The price on limes runs between 50 and 100 for $1. You can also get two pineapples or several large, sweet mangos for $1. Don’t expect to find neatly wrapped bunches of bananas, though. You will see both bananas and plantains being sold by the branch. Of course if you don’t want to buy several dozen bananas at a time they are sold in smaller quantities. One variety you won’t to miss is the “orito.” This miniature banana has a smooth texture and a sweet taste. The going price is usually ten for 25 cents. Not only is the produce fresh, the prices are low. For example, you can get two delicious pineapples for $1. Some of the more exotic choices include cherimoya, mamey and melloco. Cherimoya is a brownish green, heart-shaped fruit. It’s eaten by breaking open the fruit and scooping out the white flesh. Be prepared for plenty of seeds. The mamey is a fruit shaped like an avocado with a dusty looking brown skin. It is best eaten by cutting the fruit in half, removing the pit and using a spoon to scoop out the creamy, sweet orange flesh. Melloco is a tuber that can be used in soups, stews and salads. Although it looks like a small, purple speckled potato and tastes much like a potato, the texture is quite different. It has a slightly slimy feel, much like okra. The plaza also has a large, indoor fish & seafood market. Each morning the fresh catch is brought to the market. As with the produce, not only is the quality wonderful, the prices can’t be beat. With a just a dollar or two you can buy enough fresh fish to make a large meal for a family of four. Some varieties to try include corvina, dorado, pargo (snapper) and carita. Most Ecuaodorians prefer to roast or fry the fish whole, although it is possible to buy it filleted. Vendors are open until the mid to late afternoon, but the morning is really the best time to visit the plaza and the earlier the better. Locals begin arriving before 7:00 a.m. to make their daily purchases. The variety of produce and seafood available can dwindle as the day wears on. Don’t forget to take loose change and single dollar bills. Most vendors in the plaza may not have change for $10 or $20 bills. Amy. We are always looking for new investing opportunities that help the environment. Since our use of plastic bags and bottles create a huge environmental concern, I’m passing on an email from a reader. I have not researched these shares in depth yet but am sending the early idea to you. Gary, my name is Steven Stark, General Manager for a Eco Friendly company that is a leader in this technology in the US. We are a publicly traded company that has grown very quickly with major accounts such as Walgreens, CVS, A&P, Ace Hardware and etc. We are selling a number of products that include biodegradable bags, non toxic cleansers and I am responsible for eco respectful batteries made from recycled materials. Bay Street Research has issued a report on the company and shares. The report says: Perf Go Green Holdings, Inc. (“Perf Go Green” or “the Company”) is focused on the global distribution and marketing of oxo-biodegradable† plastic products that are eco-friendly, nontoxic, and compliant with ASTM D6954-04 and food contact standards. During 2008, the Company launched and marketed a total of seven biodegradable plastic products, comprising three varieties of household trash bags, plastic drop cloths, Doggie Duty™ bags, cat pan liners, and commercial trash bags—all of which biodegrade and incorporate recycled plastics. To accelerate the degradation process, Perf Go Green’s plastic products are manufactured using a prodegradant additive. Based on environmental claims made by the manufacturer of the additive, Perf Go Green believes that its products are degradable in a landfill setting within 12 to 24 months, leaving behind no toxic residue. As such, the Company anticipates that its products can offer a practical and viable solution to minimize plastic waste in the global environment. To promote consumer awareness about Perf Go Green and its products, the Company is currently implementing a diverse marketing campaign, including television, radio, national print, and online marketing, as well as search engine optimization and retail store promotions. Perf Go Green has also established a nonprofit foundation, called Go Green 21.0, to foster and promote green education initiatives worldwide. Based on agreements with major national retailers, Perf Go Green has launched products in over 22,000 retail stores to date. Headquartered in New York City, the Company began trading on the Over-the-Counter Bulletin Board (OTC.BB) in May 2008. Here is a chart of the shares from finance.yahoo.com since they began to trade. See the full report from Bay Street Research here. See details of the two seminars below. Here are comments from one seminar delegate about the way we help: Thank you for the help on my Cotacachi trip! Everything is working out great. It was a little dicey getting to Atlanta for some reason all of the flights from DFW were full. But not to worry, I just took a little side trip to Memphis then to Atlanta. When traveling standby you learn not to stress about the flights and go with the flow. The driver you arranged was great. Mauricio has been fantastic and very helpful. Peggy and Lee have also been great and spent most of the day showing me around. I really like Cotacachi is has a great energy and the people are very welcoming. Peggy and Lee invited me to go to the Otavalo market today. You and Gary picked a wonderful place to live in Ecuador!